Prepared in the field and submitted by Paul A. Mayewski (field leader) on behalf and with the approval and input of the 2000-2001 US ITASE team. US ITASE is effectively a polar research vessel. It offers the ground-based opportunities of traditional style traverse travel coupled with the modern technology of GPS, crevasse detecting radar, satellite communications and multi-disciplinary research. By operating as a ground-based transport system US ITASE offers scientists the opportunity to experience the dynamic environment they are studying. US ITASE also offers an important interactive venue for research (currently ten integrated science projects) similar to that afforded by oceanographic research vessels and large polar field camps, without the cost of the former or the lack of mobility of the latter. More importantly the combination of disciplines represented by US ITASE provides a unique, multi-dimensional (x, y, z and time) view of the ice sheet and its history. Ultimately, US ITASE will sample the physical and chemical environment over spatial scales in excess of 3000 km and up to 3000 m depth, over time periods of several hundred years (sub-annual scale) to hundreds of thousands of years (millennial scale) covering much of West Antarctica. US ITASE offers the capability for expansion of its activities into East Antarctica. The original plan for the 2000-2001 season was to have a traverse configuration that included one Tucker from the 1999-2000 US ITASE season, a new Challenger 55, one Berco sled for fuel, one Berco sled with a permanent shelter configured for 9 berths and science activities, one Berco sled configured with an active freezer system, one Polar Haven configured as a kitchen and an assortment of smaller sleds (eg., 2 Maudheims, one Polar Associate, 3 Nansens and one Komatik). Two LC-130 fuel drops (3 drops per flight) were scheduled for the season based on estimated fuel consumption. On the first leg of the traverse, at a distance of 66.6 km from our starting point at Byrd, the Tucker (although hauling a significantly lighter load than that taken during the 1999-2000 season) had a catastrophic breakdown. During the 1999-2000 season the two Tuckers utilized by US ITASE did manage to complete the traverse but with considerable effort. It is clear now that they are not appropriate vehicles for heavy oversnow traverses. On a brighter note the Challenger 55 performed beyond expectation pulling significantly heavier loads than the Tuckers did in 1999-2000 and with slightly better fuel efficiency than expected. The loss of one of our two heavy traverse vehicles had a significant impact on our style of operation. The Challenger 55 is not large enough to accommodate a driver plus a scientist and crevasse detecting radar so we lost that capability. The Challenger was not able to pull the remaining load although it did significantly out perform the Tucker. After dedicating 5 days to retrograding the Tucker plus any possible additional equipment (this unfortunately had to include the freezer) the traverse proceeded. 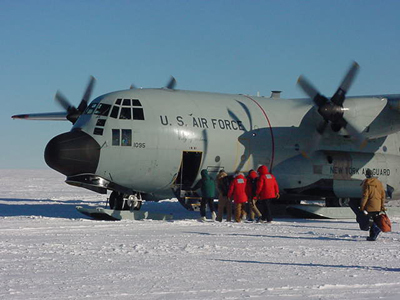 Under the new style of operation it was necessary to double shuttle loads and to request air support for the pick up of nearly 7000 out of the 8000 lbs of ice cores collected during the trip. In addition, without the freezer, the ice cores had to be buried at each work site. The new style of operation and the better than expected fuel usage of the Challenger 55 negated the need for a second round of LC-130 fuel drops, which we hope balanced our in-field request for air support to retrieve ice cores. (1) The Challenger 55 traversed a total of 2400 km. (2) Continuous radar observations were made over 800 km of the traverse route. (3) Seven out of the original nine projected science stations were occupied for periods of 2-9 days depending upon workload per site. Two sites were dropped from the original list. One site to save time after the Tucker failure. We will be able to work at this site in 2001-2002 enroute our Siple Station traverse. A second site was deleted, close to Mt. Sidley, because it has too many local climatological effects, the area may have some crevassing and a snowmobile based radar survey we conducted indicated highly contorted glacier flow unsuitable for the recovery of ice cores. (4) Reconnaissance for the proposed inland WAIS deep drilling site that was cancelled during the 1999-2000 season was accomplished. (5) A total of 664 m of ice core were recovered. (6) Seven 2m snowpits were sampled for chemistry, stable isotopes, density and stratigraphy. (7) Pemeability and porosity experiments were conducted from two snowpits and three ice cores were collected for this purpose. 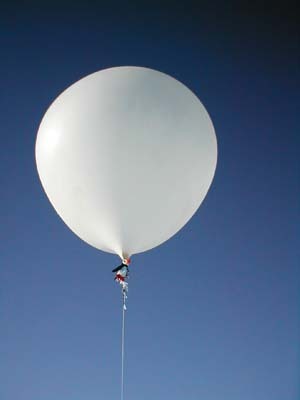 (8) Twenty-one days of atmospheric chemistry observations were conducted at seven sites. (9) Observations were made for purposes of ground truthing for satellite imagery. (10) Three automatic weather stations were deployed. (11) Eight high precision GPS coffee can experiments were deployed to measure mass balance. The information presented below does not guarantee perfect US ITASE seasons in the future, however, it is intended to be an important step in the evolution of research style oversnow traverse capability. Several discussion items follow. They represent the combined thoughts of the members of the US ITASE 2 (2000-2001) traverse. They are offered as a starting point for discussions with OPP/NSF and Raytheon. (1) A Hagglund equipped for crevasse detection. Drawbacks include this vehicles inability to pull heavy loads necessitating double shuttling by the single Challenger 55 and/or more air support for removal of ice cores and fuel drums. (2) A small bulldozer. Drawbacks include a significant reduction in traverse speed. We would definitely prefer not to have another Tucker. US ITASE 1999-2000 was fortunate to have two new Berco sleds. One was used as a fuel/equipment sled and the other as a freezer for housing ice cores plus roof storage for a variety of equipment. These sleds performed extremely well. However, an eclectic combination of other sleds followed the Berco sleds. Somelike the Polar Haven plowed through the snow causing significant reduction in speed and loss of hauling capacity, others like the Maudheim did extremely well. In our 1999-2000 end of season report we strongly urged that two additional Berco sleds be purchased, one for 2000-2001 and one for the 2001-2002 season. This would provide optimal load carrying capability. In addition, tracks made by a lead Berco would provide an advantage to following Bercos. The two new Berco sleds would replace the Polar Haven galley and science facility used in 1999-2000. The Polar Havens proved sufficient for limited travel and were required for weight saving in 1999-2000 but they have several flaws. They are fitted on low-lying runners that plow into snow on traverse. The significantly rougher conditions expected in future years would make these sleds even more effective plows, if not anchors, severely limiting overall load capacity. While comfortable the Polar Havens do not afford the insulation, sound proofing, or winter-over storage capacity of more permanent structures discussed below. Furthermore, Polar Havens require construction and destruction each season. For 2000-2001 we did not receive a third Berco in time for the field season so an Ansellen sled was given to us on loan from Scott Base. While we appreciate the loan of this sled and it is approximately 3 feet longer than a Berco it is nearly twice the weight (Berco 3500 lbs, Ansellen 6000 lbs) and also higher making loading more complicated. On a traverse weight is extremely important. In addition Berco sleds have superior runners. The US ITASE 2000-2001 team was made up of 12 members. The size of the team required a galley and the extensive use of electronics and data processing required a science facility. A science/berthing facility (Blue Room) was fabricated in McMurdo and mounted on a Berco sled for use during 2000-2001. The Blue Room contains berthing space for 9, science workspace (for computers, repairs, communications, temporary wet lab space). It proved to be an extremely valuable and greatly appreciated addition to US ITASE. In addition to the above functions the Blue Room saved considerable time versus tent set-up, acted as a warm space and will provide excellent winter-over storage space. (5) Roof space for storage and lightweight equipment tie downs. (1) Durable, warm shelter and galley capability that will be essential as US ITASE moves toward South Pole. (2) Extra berthing (at present two people sleep in the Polar Haven Galley and one in a tent because the Blue Room has only 9 berths). Note that with the four Bercos requested as of the 2001-2002 season all US ITASE winter over storage could be left on sleds or in permanent structures. This is significantly less labor intensive than placing over-winter storage on cargo pallets mounted on fuel drums. (1) Quantity 60, 55gal drums of JP8 for the Challenger 55 to travel 2400km(~.75km/gal). (2) Quantity 8, 55 gal drums of Mogas for snowmobiles and four generators. (3) Quantity 8, 100lb propane cylinders for heating the Blue Room and galley andfor cooking. (1) solar and wind power installed on the roof of the Blue Room for charging ten 12 volt 100 amp hr batteries plus radio plus computers. The concept for the system is excellent but it operated below its potential. Additional testing, more solar panels and tilted panels may correct the problem. (3) DC3 (Sky Train) and Twin Otter flights were used to shuttle personnel and retrograde ice cores from caches. Utilization of these light aircraft complimented the heavy lift LC-130 capability. Although two LC-130 flights were dedicated to US ITASE 2000-2001 for fuel drops only one was required because of the loss of the Tucker. The 109th ANG did a superb job of placing three fuel drops at sites planned for scientific activities. All drops landed exactly on target and the drums were in excellent condition. Airdrops most definitely provide an excellent way to avoid carrying large amounts of fuel and burning fuel to carry fuel. Airdrops will certainly be an important part of our plan for 2001-2002. For the 2001-2002 field season approximately 120, 55 gal drums of JP8 will be required assuming two Challenger 55s. Fuel drops will be requested for most of this fuel. However, it is highly unlikely that the traverse will be able to carry the 120 empty drums generated throughout the field season. To counter this situation we will be requesting that 500 gal bladders of JP8 be dropped instead of 55 gal drums. JP8 from these bladders could be pumped to 55 gal drums on our fuel sled. With the addition of one relatively light sled the empty 500 gallon bladders (estimated 10) plus drop materials (chutes, pallets, etc) could be easily hauled by the traverse. Note: this sled requires a middle ski and some additional strengthening to assure that it remains structurally sound throughout future traverses. A plywood constructed passive freezer utilized in 1999-2000 was fitted for the 2000-2001 season with a Thermo-King compressor to provide active cooling. The addition of the compressor would have assured that ~500m of ice cores could have been maintained at 20 degrees C throughout the traverse. With the failure of the Tucker, the freezer had to be retrograded to Byrd because of its heavy plywood construction and the necessity to severely lighten the traverse. As a consequence the freezer was never tested and most of the 9000 lbs of ice cores recovered were retrograded by DC3 or Twin Otter. For 2001-2002 it would be preferable to have the Thermo-King compressor mounted on a significantly lighter freezer unit - one capable of holding 650-700m of core (note 660 m recovered in 2000-2001 plus several boxes of snowpit samples).. Another option would be to not include the freezer on the 2001-2002 traverse, but instead depend upon retrograding the ice via DC3 or Twin Otter. The freezer was most essential for 1999-2000 and 2000-2001 because these traverse legs entered regions where temperatures commonly rise above 15 degrees C. This could be the case during the 2001-2002 traverse to Siple Station but will not be a problem during the 2002-2003 traverse to South Pole. Operating without a freezer in 2000-2001 had advantages (eg., lighter weight, greater core capacity) and disadvantages (eg., burial of cores on a daily basis, air support needed for retrograde, added handling and potential damage, possibility of loss). (1) It is light in weight and can be easily transported without complete disassembly on a dedicated Maudheim sled. (2) It takes a 3 diameter core and therefore requires fewer core boxes to transport and store the core. (3) It requires only one person to set up and disassemble. The Eclipse drill recovered approximately 660 meters of core during the 1999-2000 season. The core quality was excellent throughout all drilling depths making processing easier. It provides a better sample to analyze for high resolution records. With a few relatively minor modifications this drill can penetrate deeper depths as needed. It is much easier to use than the standard 4  PICO drill and allows the driller to produce high quality cores in marginal conditions. (1) Modified cable termination/slip ring assembly. The cable termination used for the steel drilling cable can be modified to eliminate the intricate termination process in the field. An external slip ring would not only be more robust but would also remove it from its present location in the hammer section to a more safe location above the drill. (2) A telescoping mast could be made which would allow continuous cores to be taken starting at the surface. This would allow retrieving the upper 2 meters of core as opposed to having to excavate a 1.1 meter drilling pit is dug to allow for the tilting of the drill. This innovation could also significantly reduce the necessity for some types of snowpit sampling. (3) The anti-torque section needs modification to present a more effective profile to the borehole wall. A double set of 3 springs would offer more resistance to torque and would allow a slight bit of vertical adjustment which would enable the drill to penetrate past a point where the drill has spun in the borehole. Along with this spring modification would be possibly a heavier motor section that would smooth out the vertical travel of the drill in the borehole. (4) A more extensive spare parts inventory. Some essential drill components had no spares available. Mission critical components should have adequate spares. Overall the Eclipse drill worked very well and produced cores of unsurpassed quality. With the incorporation of some essential modifications it is clear that this drill would be the drill of choice for almost any shallow to intermediate coring programs. The Field Mountaineer for ITASE has three distinct responsibilities: field mountaineer, safety officer and food manager. As Food Manager weekly dry and frozen food boxes are prepared in McMurdo. On the traverse the weekly food boxes are organized into labeled bins in the galley. Daily dinners are prepared for the entire party, breakfast and lunch is the responsibility of the individuals. In addition, a weekly cleaning schedule is prepared by the food manager. The Food manager melts all snow for water supply for cooking, drinking and traveling consumption. Food Manager prepares kitchen for travel and reorganizes the kitchen for camps. The Field Mountaineer is the person responsible for any first aid issues and is the main medic. Upon arrival in McMurdo, the Field Mountaineer trains all new traverse participants in the Happy camper snow school. A shakedown trip for all participants to Cape Royds or elsewhere is a good way to get people into the group spirit, as well an opportunity to get new people used to ski-doos. While on the traverse the safety officer watches that participants are communicating and making safe, smart decisions around heavy machinery. While traveling the safety officer takes turns along with other field members driving and navigating by GPS. The safety officer is responsible for setting up briefings related to electrical, chemical and kitchen fires. When at science camps the safety officer helps as needed. 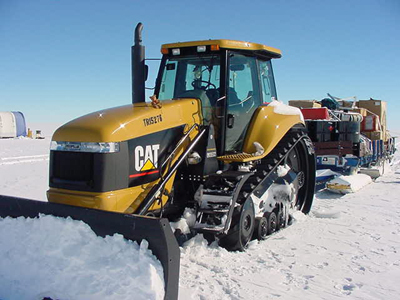 Roles they can expect to fill are field assistant, drilling assistant, radio communications, shoveling, heavy lifting, skiway airstrip preparations, snow machine driver, sledging, etc. Suggested training courses for the ITASE Field Mountaineer/Safety Officer might include: an Industrial Safety Course, which includes electrical and chemical fire safety and heavy machinery safety and continued Crevasse Training including industrial extraction. (1) Group splitting to double shuttle loads, due to loss of Tucker- Detailed check out plan for communication with second party. Survival gear required. (2) Moving heavy equipment in close proximity to people - Radio or hand signals used. (3) No crevasse detector due to loss of second vehicle- Relied on RADARSAT images, reconnoitered questionable area using a ski-doo-Nansen rope system for protection. (4) Sleds that plow snow while traveling (Polar Pooper and Polar Haven Kitchen)- Pooper hauled off center to prevent snow build up. (5) Kitchen floor a hazard after travel, highly suggest galley/berthing unit for next year. (6) Increased fire hazard related to storage of chemicals in the Blue Room- Fire extinguisher stored next to wet lab. Need Haz-mat box for next year. (7) Fire in kitchen or electrical fire in Blue room- Fire extinguishers stored near high-risk areas. (8) Heavy lifting- Many people to help with these tasks. (9) Environmental injuries- Sun screen and hand warmers available. (10)Dehydration- cold and hot water always available. (11). Poor decisions due to fatigue- clear communication prior to action. (12) Crevasse potential - pre-season crevasse rescue training, mid-season reminder, before reconnoiter. We used a toilet mounted on a sled during US ITASE 1999-2000 and again in 2000-2001. The system worked very well although the low clearance on the runners did produce plowing problems resulting in damage to the sled. A sturdier, higher clearance sled would be preferable. We were issued 4 HF PRC 1099s and four VHF radios and borrowed a 100 watt HF system from Byrd. Daily communications were reasonable despite two solar disturbances. In addition we were issued a GOES satellite system largely to be able to maintain our outreach connection with the Boston Museum of Science. We were fortunate to have a communications technician with us for the first half of the season (Bob Zook). The GOES system required several days of major tweeking and with each change of site minor tweeking. Without Bob it is unlikely that we would have been able to set the system up. The GOES IP phone worked infrequently but email was quite dependable. Loan of the GOES system and support is greatly appreciated. Considerable effort on the part of the Raytheon put in team and later the US ITASE traverse team was necessary to dig out cargo lines buried during the 2000 winter-over of US ITASE equipment at Byrd. We recommend for the 2001 winter over of equipment that the Challenger be utilized to build snow berms on Byrd Hill (rather than downwind from Byrd Hill) and that cargo lines be developed by staging equipment on Berco sleds and in the Blue Room. US ITASE 2000-2001 was comprised of 11-12 people throughout the season. Numbers varied because of the loss of one individual early in the season due to medical problems and changeover in personnel. Names of all individuals involved in the field season appear in the beginning of this report. For the 2001-2002 season we suggest a team composition very similar to the 2000-2001 team. Three positions require special highlighting, two from Raytheon and one from Ice Core Drilling Services (ICDS). The two Raytheon positions are Camp Manager/Mechanic and Safety Officer/Food Manager. The ICDS position is Ice Core Driller. We were particularly lucky that Raytheon chose Steve Niles and Cobi Harris to accompany US ITASE this season. Steves previous expertise as Byrd Surface Camp Manager, mechanical skills and willingness to participate in every Challenger shuttle leg were essential to the success of this years program. Cobis mountaineering and guiding skills coupled with her excellent organizational skills assured that this season ran safely and comfortably. The US ITASE ice core driller contracted by ICDS for this season was Mark Wumkes. He was instrumental in the success of the two major deep ice core drilling activities conducted by the US  GISP2 and Siple Dome. His broad ranging expertise guaranteed the remarkable success of this seasons ice coring activities. The 2000-2001 US ITASE team owes a great debt to these three individuals and we sincerely hope that ICDS and Raytheon support their involvement in future US ITASE activities. Based on the experience gained during the 1999-2000 US ITASE seasons we propose the following operation style for the 2001-2002 US ITASE traverse. Although details of the exact route still remain to be developed based on examination of RADARSAT images and scientific and logistic considerations we plan to traverse from Byrd to the general region of Siple Station back to Byrd for a total of approximately 2200km. We plan to make between 6 and 10 several day stops and conduct radar experiments en route. The traverse team would be comprised of 12 individuals, two Challenger 55s, four Berco sleds (including fuel sled, ice core/science storage sled, Blue Room (science/berthing) and a permanent galley/berthing structure) plus lighter sleds (including Maudheims, Polar Associate, Komatiks, Nansens and Polar Pooper). LC-130 fuel drops plus DC3 and Twin Otter ice core retrograde would be utilized in much the same manner as during the 2000-2001 season. (1) US ITASE no longer has a second heavy oversnow vehicle. We recommend that a second Challenger 55 be purchased. construction is critical if the traverse is to be weight efficient. (3) Fuel drops utilizing 500 gallon bladders should be considered for this season to avoid having to carry the estimated 120, 55 gal drums of JP8 required for travel. With the addition of one more light sled (eg., Maudheim) empty bladders and air drop equipment (eg., chutes, pallets) can be relatively easily retrieved. (4) A lighter weight ice core freezer capable of carrying 650-700m of ice core with active cooling (utilizing the existing Thermo-King compressor) or several DC3/Twin Otter ice core retrogrades. Several aspects of US ITASE could be expanded upon if new proposals are funded. However, if the current and proposed operation style is maintained it will not be possible to accommodate many new types of programs. Limitations will always exist in the amount of core that can be transported and maintained at temperature. If, for example, duplicate cores are required at sites this will reduce the spatial coverage, which is a mainstay of the science program. Requests for additional space in the Blue Room science facility should be carefully considered. Space is at a minimum and it is not clear that any fully dedicated space can be guaranteed. The understanding thus far is that all science space is shared. (1) A more robust deep radar system is essential. (2) Shock absorption for shallow radar equipment is needed when it is operated from a snowmobile platform. (3) Reduction in redundant snowpit sampling (notably density and stable isotopes) could be accomplished through more cooperation between programs. (4) Modification of ice coring equipment to allow core collection from surface rather than 1.1 m depth to reduce dependency on snowpits. (5) Addition of a lightweight 2 ice coring system to accommodate special projects such as: fast snowpits and extra spatial coverage. (6) Utilization of upflow ice cores for more measurements than total beta activity (eg., chemistry and isotopes) to test small scale spatial gradients. (7) Expansion of atmospheric sampling program to include major aerosol species. (8) Reduced set up time for atmospheric sampling by employing a more permanent space for this equipment. Set up of the rather fragile atmospheric system in a Scott tent some 500 m away from camp took usually a full working day, allowing on average sampling for two 24-hr cycles at each location. However, operation time at each site can be increased significantly by mounting the system permanently in a more rigid structure on top of a Komatic sled. This will be of importance in upcoming seasons where only 2 day stays at each site are planned. (9) Only the 5 or 4 kW generators provided constant enough power to run a UPS for atmospheric sampling which is key to protect PMTs and Hg- and Cd-lamps. In the future we would like to investigate the use solar power to perform these clean air measurements. A 650 W generator could serve as a back up and batterie charger. 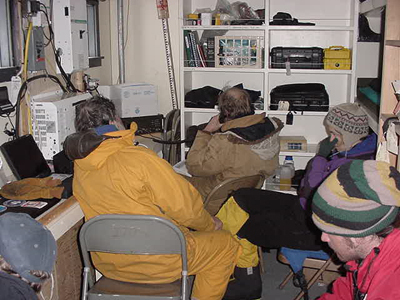 During the US ITASE 2000-2001 field season the field team participated in several outreach activities. These included: a Sunday lecture in McMurdo (PM), news article for Antarctic Sun (PM, ZS), biweekly live interviews with the Boston Museum of Science via phone patch through McMurdo (1 November to mid January (entire team)), daily updates via GOES email link (ZS), media visit to our field site by National Geographic. (1) High resolution 400-MHz profiles to between 65 and 125 m depth were acquired along the entire 800 km main traverse. About 40 km of transect profile are missing because of mismanagement in the Raytheon medical office, and loss of personnel due to medical problems. The depths profiled far exceed the 56 m obtained last year, provide no loss in layer resolution, and were achieved after some experimentation with recording parameters. Thus we now have the ability to profile the entire firn regime. It appears that in any profile, but especially in the higher accumulation zone in the eastern part of our traverse, a few reflection horizons are expressed as isolated wavelets. These may be followed for hundreds of km, and will be used as isochronal surfaces for accumulation rate studies. Almost all reflections can be reasonably tracked entirely because the apparent folding (a topographic effect on accumulation rates) is not as intense as seen last year. All strata appear surface conformable, but firn thickness between any two horizons can vary by several meters depending on location along the profile, and dip up to 20 m.
(2) Other observations are as follows. Layer horizons separate into isolated reflections at the anticlinal parts of folds (possibly on hilltops where accumulation is less), as opposed to interfering multi-reflections in synclines where accumulation may be much greater. Our extended traverse from site F to G (site not cored and near Mt Sidley) revealed the tightest folds, some of which appear disconformable with each other, and confirmed Paul Mayewskis decision to avoid coring near Mt. Sidley site. These folds appear to be tectonic in origin as there appears to be no surface topography which could cause them. (3) Experimental 100-MHz profiles were acquired at site E and the proposed WAIS core site for comparison with those at 400 MHz to look for relative amplitude changes in the same horizons. My preliminary assessment is that the lower frequency shows more sensitivity to some horizons and through large depth changes so that their reflectivity must be related to electrical properties other than those caused by density changes. However, the 400 MHz profiles provide far superior resolution, as expected. (4) Only a few profiles were acquired in other directions about the core sites because it is now clear that our main traverse profiles truly represent the disposition of the strata to within several km of any site, and because of limited resources caused by the loss of the Tucker. Nevertheless, we acquired 25-50 km extensions at the proposed WAIS core site and sites C, E and G. The extensions at sites C and G helped to fill in the profile gaps necessitated by our lost Tucker and need to avoid the apeces of our traverse. 5. Although we were unable to run crevasse detection radar because of the lost Tucker and the need to move along quickly, there is no evidence in any of our profiles that we had encountered crevasses. This information is important for future traverse studies. My immediate priority is to process all profiles with spherical beam spreading loss compensation. Distance normalization (to account for changes in profiling speed) and topographic corrections will be made when the GPS data becomes available from Gordon Hamilton and Leigh Stearns. I will then prepare some of my most important results for the AGU meeting in Boston. We will establish core stratigraphic correlations when the core results are obtained. For next year we will give serious consideration to using a deep sounding radar we have developed and tested on smaller glaciers and which need not be operated from a small shelter in hopes of achieving the deep sounding information missed during this and last years traverse. During the 2000-2001 US ITASE we sampled snowpits and retrieved (with the support of Mark Wumkes) and prepared ice cores for the following projects: University of Maine (major anions, cations and MS), University of Arizona (reversible ionic species), CRREL (permeability and firn structure), CRREL (ice core stratigraphy), University of Washington and University of Colorado (stable isotopes), University of Maryland and NASA (snowpit stratigraphy). 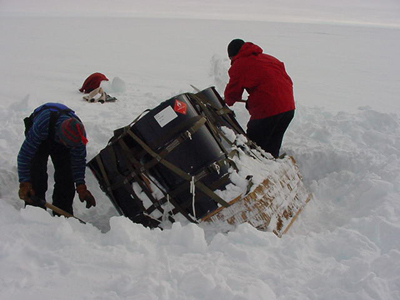 Ice cores (total 660 m, 9000lbs) and snowpits (2m per site) were recovered and packaged at seven sites for the common use of the research teams noted above. The ice cores ranged from 105m in depth at the proposed WAIS core site to on average 60m at other sites plus several 15-30m ice cores dedicated to other projects. (1) Snowpit and ice core sample coverage over the regions bounded by 77-82 degrees South and 105-130 degrees West. (2) Integration with surface glaciology activities conducted by Gordon Hamilton and Leigh Stearns to allow deconvolution of local topographic effects from the accumulation rate record. (3) Integration with shallow radar activities conducted by Steve Arcone to assess the source of radar reflectors and to enhance interpretation of ice core records through 3D views of core sites. (1) Calibrated proxies for atmospheric circulation features such as the Amundsen Sea Low, ENSO, the Antarctic Circumpolar Wave and katabatic flow. (2) Calibrated records that document variability in, for example, sea ice extent, volcanism, marine biogenic activity and trends in major ion chemistry deposited over Antarctica. (3) Detailed understanding of the spatial and temporal (sub-annual to multi-decadal) complexities in climate within and related to Antarctica. After environmental difficulties during the first season of ITASE, we expected our summer efforts to result in greatly improved radar profiles. Although we have overcome the temperature problems with our equipment, software and the extremely rough conditions of the traverse created a new suite of difficulties. Our 12-bit radar system should be a great improvement over the old system used by Bob Jacobel at Siple Dome in 1996-1997. However, the ruggedness of the ITASE traverse requires new designs for the antennas, peripheral devices, and software. I found that of all the ITASE programs, the deep radar is most vulnerable to the rough conditions created by the traverse vehicles, most notably the ruts created by the Challenger and the ability of the vehicle to pull the radar system without warning. The new insulated radar shelter mounted on an extra-wide Komatik sled works very well for the most part, keeping the equipment at temperatures above freezing with only limited need for heat blankets. However, the deep tracks of the Challenger caused the sled to plow in the snow so we revised the harness to have the sled track off to the side of the traverse train. The flatter snow outside the tracks gives the sled and the computer a gentler ride, but puts severe strains on the radars forward receiver antenna. Additional strain is placed on the front transmitter antenna as its sled tracks in and out of the Challenger ruts. The deep ruts resulted in four broken antennas and much lost data. When the antennas break the radar signal is lost and much time was spent tracking the signal loss to the problem (the antennas are sheathed in nylon webbing that hides the breaks). Once the antenna problem was found, several attempts were made to create a more robust towing system for further travel, but there was little success with the limited resources available. With the problems of cold and vibration virtually eliminated, the new radar system worked well enough to find some software bugs that occasionally erased or corrupted data files. These problems have mostly been isolated and the fixes will be implemented before the next field season. Despite the difficulties, I was able to collect some 20 km of verifiable data and approximately 100 km of questionable data with the new radar system. Further processing in the lab will show the quality of the data sets. Due to the problems with the new system, I moved to the old system that Bob Jacobel used during last years traverse to collect data at the Swithinbank and Mid-Camp sites. For reasons that are still unclear, this old system was also unable to collect data due to a great deal of ringing in the antennas. Software and technical questions were easily resolved thanks to email access through the GOES-3 connection. A variety of tests showed that the generator, traverse sleds, and other local power sources (generators, inverters, etc.) caused small amounts of electrical noise, but were not the primary sources of the interference. Broken antennas were replaced or repaired to eliminate them as problems. At this stage we believe that the problems with the old system are either due to damaged equipment (either in shipping or due to the traverse), the radar shelter itself, or operator error. This years traverse showed that the travel conditions are far rougher than we had expected. As a result, our equipment needs to be strengthened before the next field season. The antennas and their connections must be strengthened, all electrical connections need strain relief and locking connectors, and the computer software must save the data to permanent storage to avoid data loss during power failures. The antennas present the greatest difficulty since they are each 20 meters long. We expect to look into either suspending the antennas above the snow or to encase the antennas in a stronger sheath, such as PVC pipe or a fire hose. To test the robustness of the system, we will either field test it during summer glacier field work, or tow it through farm fields around campus in order to simulate the terrain of the ITASE traverses. (1) Continuous, high-precision GPS profiles along the full traverse route. Additional local profiles of elevation were collected at the Inland WAIS site. These data will be used to provide geographic and topographic control for the CRREL ground-penetrating radar. One of the objectives of the combined GPR/GPS work is to understand the pattern of spatial variations in snow accumulation rate and the causes of these variations. Another objective of the GPS profiling is to understand the causes of brightness variations observed in the RADARSAT mosaic of West Antarctica. (2) Installation of eight coffee-can sites to measure the long-term rate of change of ice sheet thickness. Three sites are located along a transect approximately orthogonal to the Inland WAIS ice divide, with a spacing between sites of ~25 km. Results from these sites will be used to test for migration of the ice divide with time. A fourth site is located approximately 50 km across the divide into the Amundsen Sea sector of the ice sheet. (3) Collection of seven shallow firn cores for accumulation rate. The cores will be analyzed for gross beta radioactivity. Derived accumulation rates will be used in the calculation of ice thickness change rates and in understanding local variability in snowfall around the ~200 year core sites. At Site C, spatial variability in accumulation rate was studied using GPR. (4) Mapping surface topography and measuring horizontal velocities at the ~200 year ice core sites. The purpose of this work is understand the ice dynamic effects on ice core accumulation rate histories. (5) Installation of three automatic weather stations/RASCALs (Remote Autonomous System for the Control of ALtimetry) at coffee-can sites close to the Inland WAIS ice divide. The instruments are designed to study the timing and causes of transient fluctuations in snow surface elevations. This work is related to understanding and interpreting the results from ICESat, a NASA spaceborne laser altimeter scheduled to be launched in December 2001. The instruments will also provide meteorological information about the Inland WAIS region in advance of the potential deep ice core program. 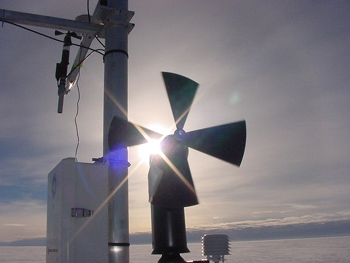 Each instrument is equipped with: wind direction sensors at two vertical levels, acoustic depth gauges (snow elevation sensors) at two vertical levels, air temperature at two vertical levels, barometric pressure sensor, thermocouple probes at four levels in the shallow firn, linear transducers at four levels in the shallow firn (to continuously record firn compaction). Instruments are powered by a battery bank buried beneath the surface and recharged using solar panels mounted on the mast. Data is stored on a data logger; there is no telemetry. 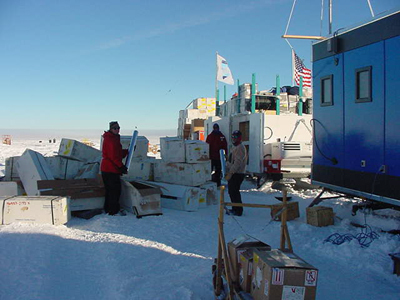 Other than the vehicular problems experienced by the whole traverse team, there was only one problem that inconvenienced the surface glaciology program: a box of science equipment was lost between the time it was entered into the cargo stream in McMurdo and put-in at Byrd Surface Camp. The box contained a number of important items, including a survey level rod, and anchors, washers and wire cable used in the coffee-can work. There was a slight delay in having replacement parts fabricated properly, which led to one lost day of work. Unless the box is located, there will be a monetary loss of ~$1,000. 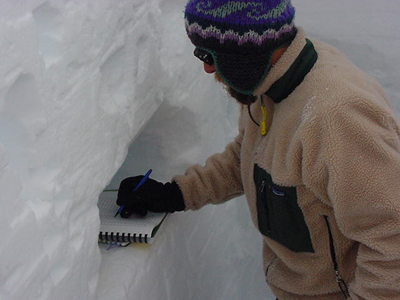 During the 2000-2001 US ITASE field traverse, six snow pits were sampled for stable isotopes and density to a depth of 2 meters and one pit at the proposed inland WAIS site was sampled to a depth of 3 meters. All pits were sampled at 2-cm resolution, which will allow the study of sub-annual to sub-seasonal climate variability with broad spatial coverage. Species that will be measured at the University of Washington include d18O, dD, and deuterium excess. The University of Washington will also be responsible for measuring stable isotopes in the 7 ~60-meter cores obtained by the US ITASE traverse. Visual stratigraphy was done in the field in each of the snow pits at 2-cm resolution. These observations will correspond with density measurements and stable isotope measurements in each snow pit. 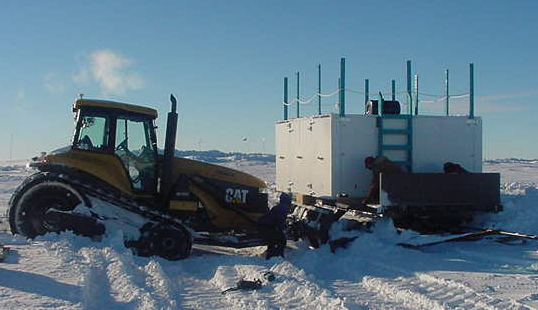 On an experimental basis, two snow pits were sampled at 10 cm resolution for analysis of nitrogen and oxygen isotopes in nitrate, and surface snow samples were obtained at four sites. If results prove successful, this work may be further incorporated into subsequent field seasons. Stable isotope sampling adds relatively few logistical complications to the US ITASE traverse. The only major concern this season has been the storage and transport of the nearly 800 samples. If the 2001-2002 US ITASE traverse has a freezer aboard, some space should be designated to stable isotope samples, as the samples must be kept as cold as possible. Additional considerations for next year include: Increased high-resolution spatial coverage at each drill site, perhaps achieved by several ~3 m deep, 2-inch diameter firn cores; greater collaboration with the University of Arizona and other institutions on density and snow temperature measurements; expansion of sampling for nitrogen and oxygen isotopes in nitrate; establishment of atmospheric stable isotope monitoring achieved with a vapor-trapping system. -Calibration and correlation of the stable isotope signal with data from automatic weather stations, satellites (including SSM/I (scanning sensor microwave/imager) and SMMR (special sensor microwave radiometer), and meteorological reanalysis. -Characterizing the distribution of stable isotopes across West Antarctica. -Understanding source conditions/locations of moisture transported to the Antarctic ice sheet. -Interpreting the stable isotope record with respect to climate variability on a variety of spatial and temporal scales. In global change research it is of major interest to understand how the composition of the earths atmosphere has changed over time due to natural and human causes. An important parameter is the atmospheres oxidation capacity, which ultimately controls the removal of greenhouse gases and pollutants from the gas phase. Among the major atmospheric oxidizing agents are the OH-radical, ozone (O3) and H2O2. Only the latter is preserved in ice cores. In addition, organic molecules such as higher peroxides and formaldehyde act as photochemical reservoirs for the OH-radical. All these compounds are, however, reversibly deposited to the ice sheet such that between snow fall and burial and eventually pore close-off the chemical signature of these species changes due to physical and chemical processes. Once these non-linear exchange processes are understood ice core records of peroxides and formaldehyde provide a valuable archive of how atmospheric chemistry has changed due to anthropogenic emissions or the ozone hole. Major goals for the US ITASE traverse are to establish a picture of spatial variability in West Antarctica of peroxide and formaldehyde concentrations in the boundary layer and upper snowpack layers. Also the question, if the snowpack is a potential source of these species to the lower troposphere is adressed. In addition, information about parameters controlling the chemical exchange such as accumulation rate, air and snow temperature and wind parameters need to be monitored or derived by other means (e.g. net accumulation through the strong seasonal signal of H2O2 preserved in ice cores). This involves atmospheric measurements and snow pit sampling (incl. density and temperature). (1) A total of 21 days of continuous atmospheric measurements of formaldehyde (HCHO), hydrogen peroxide (H2O2) and higher organic peroxides (e.g. methylhydroxyl peroxide MHP) have been conducted. This involved monitoring diurnal cycles and detecting the levels of these trace gases in firn air and at various heights above the snow pack. HCHO is measured with a commercial instrument made available by the Alfred-Wegener Institut, Bremerhaven (Germany) and peroxides with a custom made instrument assembled in our lab in Tucson, Arizona. The analytical method is based in both cases on an aqueous phase reaction with subsequent fluorescence detection. Separation of higher peroxides is achieved by use of High Pressure Liquid Chromatography (HPLC). All reagents and liquid standards to calibrate the instruments on a daily basis are prepared in a temporary wet lab in the Blue Room. Mean HCHO concentrations are also measured by means of DNPH cartridges which absorb organic molecules from a constant air stream pulled through a portable water purification system available for the generation of clean water. (3) One set of snow samples (420 total), kept in SCHOTT bottles, will be analyzed in the Crary Lab right after the pull out from Byrd Surface Camp. A second set will be transferred to Arizona for future analysis of ionic species, such as formate or acetate. Already before further data processing it can be stated that among the results are the first reported quantitative measurements of MHP in the boundary layer over Antarctica. At the conclusion of the 2000-2001 field season the outreach efforts will be continued and include: presentations to schools and organizations around the country, enhancement of the US ITASE web sites (Boston Museum of Science, www2.umaine.edu/USITASE), the distribution of US ITASE posters and standards-based educational materials, and scheduled teacher workshops. The goal of the educational outreach program at the Institute for Quaternary and Climate Studies (IQCS) at the University of Maine is to educate students and the public about climate change and the US ITASE program. To accomplish this goal, the outreach program focuses on disseminating information through the use of web sites, posters, school visits, IQCS facilities tours, written standards-based educational materials, and teacher workshops. These standards-based educational materials translate scientific information from the US ITASE program for use in K-12 classrooms and by the general public. Much of the outreach efforts are accomplished through liaisons set up between the IQCS and the Boston Museum of Science, the Wright Center for Science Education at Tufts University, the Rythmics Sonifications Laboratory, the United States Cold Regions Research and Engineering Laboratory, and numerous other institutes and agencies. The educational materials developed correspond to both state and National Science Standards. The use of standards-based materials stems from the growing need by educators around the country for science curriculum guidelines. Student laboratory exercises, that follow the state and national standards, have been written based on actual polar research experiments done on US ITASE. These laboratory exercises include topics such as measurement of permeability and porosity of snow, radar, ice core interpretation, mapping, and glacier flow modeling. A video on the US ITASE program is being produced. Most of the footage in the video is taken on location in Antarctica during the 1999-2003 field seasons. When complete, this video will be an excellent source of background information about ice core drilling projects and the US ITASE program. This video is being produced in cooperation with the Boston Museum of Science and the IQCS. Two teacher workshops for the US ITASE program were held in the last twelve months and two more are organized for the next twelve months. This years workshops will be held at the IQCS facilities at the University of Maine. These workshops provide teachers background information and experience with the scientific project, and are supplied a full assortment of educational materials to take back to their classrooms. Workshops are advertised through the New Hampshire Science Teacher Association newsletter, the Maine Science Teacher Association list serve, and the Boston Museum of Science web site, and other resources. Members from the US ITASE team are on-hand to present to teachers. On July 25th, 2000 a three-day teacher workshop, Studying Climate Change in the Classroom, was held in Wolfeboro New Hampshire. This workshop was co-sponsored by the Climate Change Research Center at the University of New Hampshire and the Wright Center for Innovative Science Education at Tufts University. It was filled at twenty-nine teacher participants from five countries and twelve US states. The three-day event involved the presentation of IQCS-developed materials, a look at current earth science teacher/student programs, participation in interactive laboratory exercises, and presentations by guest researchers and peer teachers. Sessions were presented by Dr. Paul Mayewski (co-director of the IQCS), Dr. Barry Keim (NH State Climatologist), Dr. Stephanie Shipp (co-PI of Teacher Experience in Antarctica), Dr. Jack Ridge (Tufts University geology professor), Dr. L. David Meeker (University of New Hampshire), and area high school teachers. Full-time educators that work with students in grades 6th and up were eligible to apply. This workshop was free to participants. Workshops in the next 12 moths include a one-day teacher workshop to be held in the Spring of 2001 and a 3-day teacher workshop, co-sponsored by the Wright Center at Tufts University, to be held at the IQCS facilities at the University of Maine in July 2001. Other presentations on US ITASE will also take place at the North East regional Geological Society of America conference in Burlington Vermont and at the Maine Science Teacher Conference both in the spring of 2001. Proposals were also written to present at the National Science Teacher Association (NSTA) regional conferences in San Diego and St. Louis, and the 2001 NSTA national conference. The IQCS maintains two web pages, one provides information about the department and ITASE/US ITASE (http://www2.umaine.edu/USITASE) and another, in collaboration with the Boston Museum of Science, focuses on the US ITASE project. The department web page features many of its current projects (including US ITASE) data sets from the research projects, abstracts from professional papers, and links to other pertinent web pages. This web page is useful for audiences that have a general understanding of climate change and can utilize data sets. The text and pictures offer a basic introduction to climate science and the data sets offer a rarely offered opportunity for students to graph and interpret real data. Students can then develop their own ideas about climate change from the data sets. The US ITASE web page, in cooperation with the Boston Museum of Science, offers an array of links that provide background information about Antarctica and an interactive section that directly links the public with the scientists in Antarctica. The interactive section has three parts: a question/answer section where people can ask questions directly of the scientists in Antarctica; a section with daily updates from the field team; and an archive of the live phone calls made from the field team in Antarctica to the Boston Museum of Science. 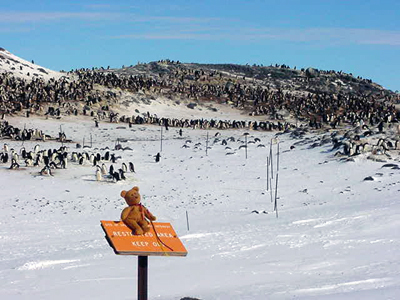 Daily communiqu�s from the team in Antarctica focus on both current weather information and the daily work of the team. 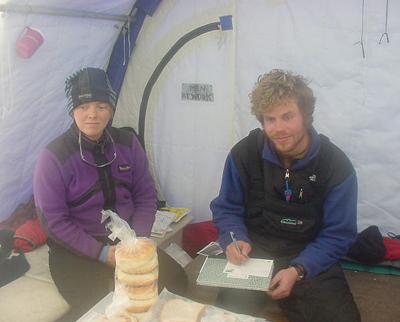 Since an important aspect of the expedition is to collect ice cores, a log of the total amount of ice core drilled was also recorded. Through this section people worldwide can stay abreast of developments with the team as they travel across Antarctica collecting ice and snow samples. This segment is also highlighted by digital images sent through the Internet by the team. The Boston Museum of Science maintains a current display for the US ITASE expedition and provides the facilities for the public to listen to the live phone conversations from Antarctica. As data is analyzed, appropriate findings of the last US ITASE expeditions will also be posted. 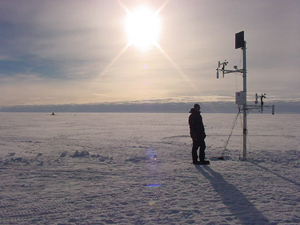 This web site includes activities for students to dress the scientists and to investigate relationships of paleoclimate records as collected on the GISP2 Climate Card (data from the Greenland Ice Sheet Project 2-GISP2). For US ITASE a high school/middle school-appropriate poster has been developed. These posters contain vivid photos and diagrams along with written descriptions that explain the project. The posters, approximately 24 x 30, are designed to be hung in middle school and high school classrooms and serve as a graphic reference for the project and a stimuli for generating student questions. Each poster also contains the projects web site and the list of participating institutions involved. This is considered an important section of the poster and helps students obtain further information as well as providing an understanding of the extent of collaboration in current scientific projects. The poster is given out free at school presentations and teacher workshops. Money to produce the poster was provided through the IQCS departmental budget. Future plans include production of a larger number of posters for distribution to more classrooms. During the spring of 2000, presentations at over two dozen school were given. Classroom presentations were made to students in grades kindergarten through 12th grade. Before each presentation, teachers were supplied with grade-appropriate outlines for the presentation with the flexibility to adapt to each classrooms specific requirements. Presentations focused on the environment of Antarctica for younger grades to the interpretation of data and the sensitivity of Antarctic climate for older students. Important scientific concepts, such as age/depth relationship that corresponds to the Law of Superposition, were introduced at age-appropriate levels. Each teacher was also supplied with all available IQCS educational materials and recommendations were made for follow-up activities with the students after the presentations. Follow-up activities often took the form of classes writing their own books on Antarctica, in a form similar to that of Aurora Australis, the book published by Ernest Shackelton and his men on the 1907-1909 British Antarctic Expedition. For Aurora Australis, Shackelton and his men wrote short stories and poetry and produced lithograph illustrations about their time in Antarctica. The books produced by students typically remain in the classroom for reference by the students. Many more presentations have already been requested for 2001. The facilities of the IQCS are always open by appointment for tours. The department houses ice cores from all of the IQCS ice coring projects including Asia, Antarctica, and the Arctic. Tour participants are taken through the ice core storage freezer, the ice core processing rooms, and the chemical analysis laboratories. The complete one-hour tour provides participants with an introduction of the departments research and a view of the process of collecting ice cores in the field to the final stage of data analysis. 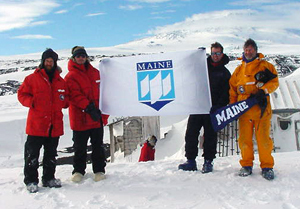 Students tours have also been given in cooperation with other scientists at the University of Maine. The written materials that have been developed are in three forms, background information booklets, classroom laboratory exercises, and the GISP2 Climate Card. Another product, titled Glacier, Climate, and the Landscape, is an educators guide to glacial geology and glacial morphology land features. Over a dozen classroom laboratory exercises have also been produced that are in different states of classroom testing. The classroom exercises are written largely for grades 5 through 12 and have a focus on polar science. Many of the exercises are original and closely follow experiments done by scientists on polar expeditions. The exercises are written for teachers that would like their students to perform laboratory experiments and demonstrations that allow them to understand important scientific concepts typical in polar studies. The concepts include; albedo, porosity and permeability, radar, depth to age relationship, and the structure and development of glacial morphological features. The laboratory exercises are standards-based, hands-on, multi-stepped, and typically require students to quantify and graph their results. These exercises are available to teachers of any grade level. Each laboratory exercise takes one to two class periods to perform. Background information, valuable resources, and a reference to specific scientists and their polar research projects are supplied with each exercise. Also being developed for each of these exercises is a photo essay or video that records real scientists performing the laboratory exercises. This photo record will assist teachers and students as they perform the laboratory exercise in their classrooms, and it will help them gain insight into how real scientists perform actual experiments. Assessment of the outreach program at the IQCS is conducted by monitoring the continued number of responses that we have received from teachers for information, live presentations, and written materials. A number of teachers have been asked to participate in a study of the effectiveness of the US ITASE outreach program. These classes range from grades K-12th and are located throughout the United States and Europe. Each teacher is asked to follow the US ITASE expedition on the web site during the field season, utilize IQCS educational materials, and have their students interact with the scientists during the expedition. These teachers have also been asked to complete written evaluations of the effectiveness of the outreach program. This will create a more comprehensive and detailed analysis of the outreach program and enable the outreach coordinator to modify the program as determined suitable by this assessment. The written program evaluations and follow-ups with these teachers will be conducted in the spring of 2001. With public interest directed at global climate change and diminishing air quality, there is a definite need for standards-based, real-time, interactive, student outreach programs. Through the use of the US ITASE program, the interactive web site, and the companion classroom-appropriate materials, the Institute for Quaternary and Climate Studies outreach program has been able to make a positive impact on students and their teachers. Plans are being finalized to host multi-day science workshops for school districts in Maine, New Jersey, and New Hampshire. Continued curricular materials and web site development, teacher/student workshops, and international partnerships are also planned.